Babyhellfire Has A Blog?! : If you've missed me, it is because I've been everywhere else. I have neglected you through the month of November , and into December. I started to upload pictures, I started to write down thoughts to share. sleeping too many odd hours, Ri working so hard, all the drama in everyone elses life, fall tv,hanging with the kid, and the doldrums of day to day housewifey crap.This is the time of year when the budget starts to get tighter, time starts to get shorter,and everything starts to just feel rougher. blogging got replaced by the instant gratification of sharing my day to day instagram, facebook, pinterest, tumblr you know- the rest of the net. In fact, i never even posted my Thanksgiving and Veggie Sunday pictures. .. and I didn't take all that many. and now, blogger-er, YOU didn't save the code I had all over the draft post for a thanksgiving post. -- you can always look for babyhellfire on instagram ,too. ..... yeah I gotta a bunch of pictures of that on my camera. Went on a field trip with her class, and found out Rory has more than one boy wrapped around her finger. I am not sure if she is a flirt, or a tomboy. Then we got a cold. there was a bunch of drama of all sorts with pretty much everyone we know. ... then, this morning the cops shut down our route to school, because they busted a methlab RIGHT NEXT to her school!!!!!!!! 10 days to xmas and we haven't even got a tree, or ANY gifts. To top it off, we had another week of " Oh crap, Ri only gets paid every TWO weeks, and we paid off the wrong thing early" Empty bank account Belt tightening mishap. Fun stuff that. - even funner when you are using your last bit of money at walmart, and end up behind the crazy coupon lady, with over 50 items in the ten item or less lane. and we had a super awesome night eating popcorn and watching holiday specials. Things are improving,I even seem to be getting sleep on occasion. I'm still not feeling blogging. Sorry for my absence, but I don't even know if I'll go back to regularly blogging or just stick with the rest of the net for a bit longer. Who knows.It been hard not to be grumpy and hermity- and when I haven't been i have been busy and social with real life people.. weird. I know. You're honestly just lucky I ran out of tv and dishes for a second. I read this again this morning just because I miss your blogs so much!!! Hope you get back to blogging one of these days!!! This blog has a search engine?! 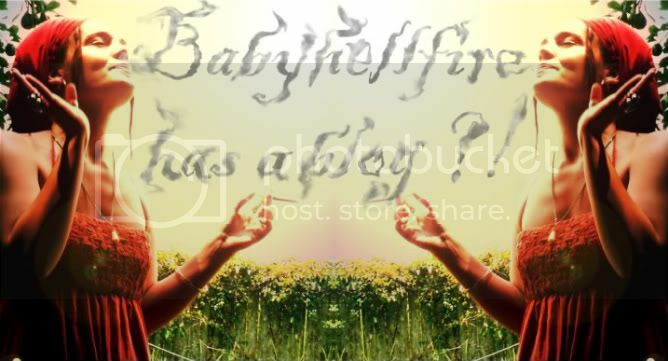 BABYHELLFIRE. Theme images by imagedepotpro. Powered by Blogger.